This is the tragic tale of a grueling hike that led not to glory, but to madness and despair.... Oooops, that's a different hike. This two-mile roundtrip hike was a great way to spend a couple hours on a beautiful spring morning. 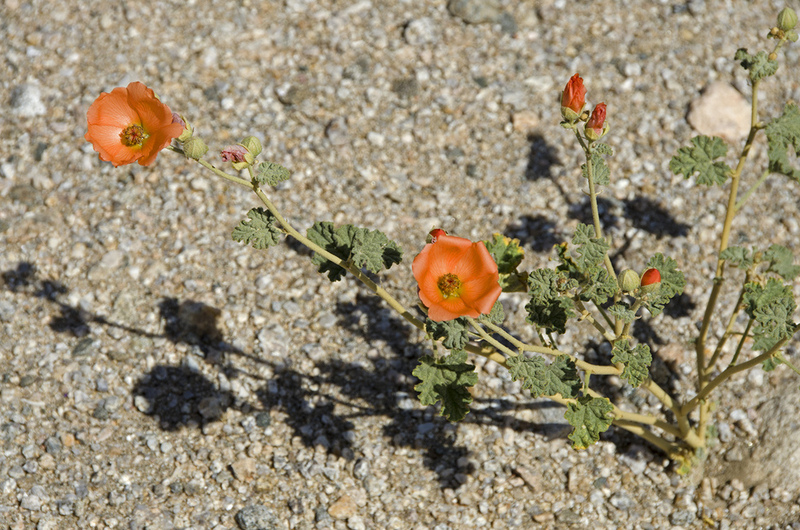 There were mines, desert gold, wildflowers and rocks to photograph, explore and contemplate. A perfect start to any day in J Tree. Why take the direct route? I'd been to the Anaconda Mine once before, but thought it was worth another visit. And it was. I wandered about the area for a couple hours, logged about two miles distance and achieved an astounding elevation gain of about seventy-eight feet. OK, so it's an easy hike, but there is a lot of interesting stuff scattered about and I'll probably visit again someday. The track to the right is the actual plot of my rambling. I tend to take the scenic route. I pulled into my parking spot a little after 9:00 am, grabbed my pack and started following the old mine road that leads to that tailing pile off in the distance. Of course, I hadn't even gone a hundred yards before I took a detour towards an interesting pile of rocks. I blame some wildflowers and rusty old cans for leading me astray, but I was glad they did. They led me to a pile or rocks that I think may have been a campsite for men working in the nearby mines. There was a lot of desert gold around these rocks, old metal cans, bits of glass and, embedded into one of the rocks, a metal ring. I wonder what it was used for. Maybe an anchor spot for a tarp or shelter of some kind? The flat area in the picture above could well have been the site of a tent. Heading back towards the mine road, I once again began following it towards the mines, but once again got side-tracked. This nice, flat spot outlined with rocks was telling me that maybe it was the site of another camp tent at one time. There was a bit of scattered glass fragments and assorted old cans nearby, it seems like the guys who used to work these mines just tossed their trash wherever it suited them. Which I'm glad they did, as sometimes I find some very cool stuff. A shallow prospect along side the road. These signs are really important to pay attention to whenever you're in the vicinity of an abandoned mine. 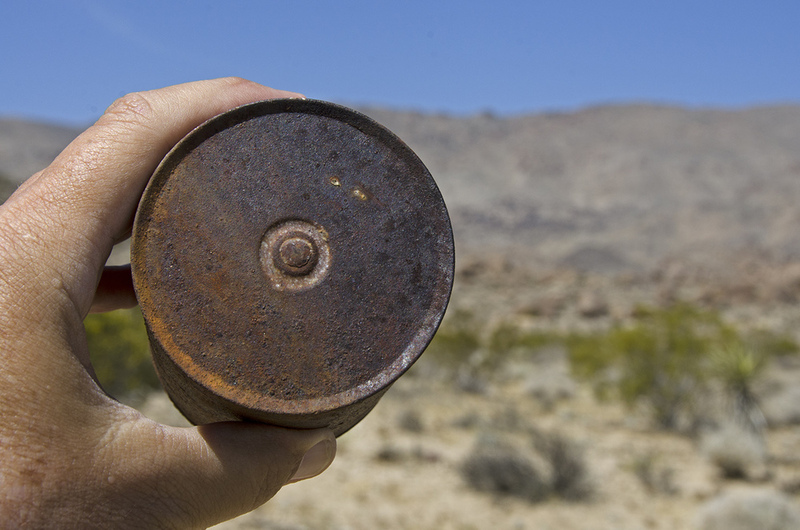 Records, facts, and solid information about many of the mines in Joshua Tree are not easy to find. A lot of what is known or surmised about the mining history of this area comes from recollections, stories and interviews of local inhabitants. And sometimes stories evolve, names and dates can be mis-remembered or changed to suit the purpose of those relating the "facts." Just because Bill McHaney said something was true, or Willis Keys remembered his father relating a story about this or that, doesn't necessarily mean it really happened. But I generally accept them at face value, because sometimes that's all there is. And they are often a great story. Mines in the old desert tended to change ownership often, as was the case with the Anaconda. A man by the name of Drinkwater may have been the first to work the Anaconda Mine, followed shortly after by a Mr. Parks. A newspaper report from the San Bernardino Daily Sun relates that the mine was owned by the Taylor-Sullivan Mining Company in 1907. That company leased the property to Edward MacDermott, a Los Angeles mining promoter. MacDermott and associates formed the Mohawk-Herald Mining Company and worked the mine for a few years, with C.W. Roach as superintendent of operations. One of the Anaconda Mine Shafts. Wire mesh covers the opening. The Anaconda appears to have been fairly productive (for the area) and even had a small, two-stamp mill on site to process its ore. By 1910, there was a 100-foot-deep shaft being worked, with the ore being hauled into Twentynine Palms for processing. Proceeds from the ore average around $1,000 per week. J. Smeaton Chase visited the Anaconda in 1919, while on his way to Twentynine Palms. He mentioned in his book, California Desert Trails, "the grouped shanties of a small mine." Three men were present, eager for any news he could provide. They shared their water, which had to be hauled four miles in from Twentynine Palms, with Chase and his horse, Kawaeh. They were good hosts. By 1930, Phil Sullivan of Twentynine Palms was listed as the owner of the Anaconda. Sullivan had arrived in the area in the late 1890s and homesteaded a tract of land. He was quite involved with the local mining activities. By this time the mine was idle. It had produced some $12,000 worth of ore during its lifetime and was comprised of four claims. The two deepest shafts reached 100 feet deep and 185 feet deep. The mine came into the possession of an E.M. Reimiller sometime prior to 1953, which is the last record I can find. I can't imagine how difficult it must have been to dig/tunnel/blast shafts down over 185 feet through solid rock into the earth. But I'm glad it was done, because I really enjoy exploring such places. This appears to be one of the main shafts at the Anaconda Mine. It has been grated over for safety, but that doesn't stop me from dropping a few small rocks through the grate to listen to how far they will fall. Don't try this at home. This panorama was taken from the edge of the main tailing pile in the photo above. Just to the left of that tailing pile, and a bit farther down its slope, are the remains of some cement machinery foundations. Perhaps they once gave footing to the stamp mill that once crushed the Anaconda ore.
After thoroughly exploring the small rise that is home to perhaps four shafts, I decided to head out towards another area that I thought might hold additional mine workings. I had spotted some gray areas on that small rise to the right of the tall rocky hill, that looked promising. My mine senses were at full alert, so I commenced hiking, following the ridge line. Twentynine Palms off in the distance. I'm glad I chose to follow the ridge line, as I found a couple of interesting things along the way. This was an interesting find. Someone spent quite a bit of time stacking these rocks here. The area behind them is rather small, so I'm at a loss as to what the purpose was. Maybe this is all that's left of a small shelter, or storage area. Perhaps it could have held runoff water for a while after a storm. It's a mystery. Heading into the hill which has the vertical shafts, this short tunnel will soon be hidden by those creosote bushes. Was this a prospect, following a vein, or was it meant to connect with one of the shafts for some reason? It didn't go back too far and there really wasn't anything interesting to see inside. Not even a bat. Continuing along my way, I passed by this shallow prospect hole. There were a couple others like this along the ridge, but they must not have proved promising, or what promise they did show quickly gave out. Another nice little peak at Twentynine Palms off in the distance. Sometimes I'll see a bunch of these Coyote melons, but this was the lone melon for this trip. Getting closer to that little hill. Another small prospect hole in the center of this picture. Taking a quick look back towards the main workings of the Anaconda, I was pleasantly surprised to see some big clouds forming off in the distance. I was pretty sure they wouldn't interfere with my day and I knew they would add some pizzazz to my photos. Just a short scramble up what's left of the old mine road. It leads to the saddle between the larger hill on the left and the smaller one on the right. I was excited to see what I would find. I found a lot of tailing rubble and a pretty good sized shaft that had been grated over for safety. I've read recently that JTNP will be closing down a large number of old mines, starting late in 2014. While I can understand the need to do so (too many careless or inexperienced 'explorers'), I'm a bit frustrated that they will be doing so. I like to peek inside old tunnels. I give open shafts, however, a very wide berth. You never know how stable the ground is around them. It looks like they shoved a bunch of huge rocks into the shaft before they put the metal grating over it. Was someone trying to take a pallet jack down into that shaft? I would have liked to uncover the rest of this sign to see what it said, but I wasn't about to scramble down there to do it. Maybe on the next visit I'll try to remember to bring along a walking stick or something, to try to uncover it. It might give a clue as to the name of this prospect, or it could just be a camp sign from somewhere in the area. After one last look around, it was time to head back to Old Blue and get going to my next stop, Pinto Wye. The short return hike turned out to be very colorful, and rusty. I wonder how many lizards or other small creatures have taken refuge in a rusty old can, to escape a predator. I was nearing the end of this particular hike and such thoughts often come to me after being in the desert for a few hours. Sometimes they are profound, most often they are not. It was another successful hike in J Tree, and like many of my favorite spots in the park, there are no signs pointing visitors to this spot. But you can see the tailings as you drive by on Utah Trail (Park Blvd.). Pull over and stretch your legs, see what you can find. I'm always happy to see Old Blue on my return. It has snacks and drinks.